Like everyone else, I have projects to finish and a long list of quilts I want to make, but when my little girls requested a heart quilt I cheerfully began sketching. 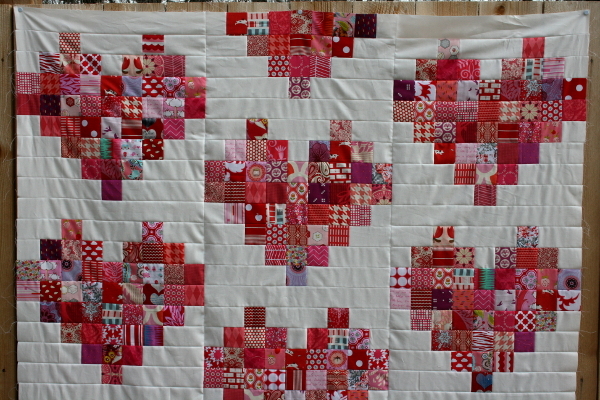 I typically don’t do much around the house for Valentine’s Day, but after having Christmas quilts to snuggle under during the holiday season I understand their request for a Valentine quilt. I enjoyed making my mini heart quilt last year, and wanted to take a scrappy approach once again but decided to go for the pixelated look instead of taking the time to make half square triangles. I sketched out a block that would finish at 18 inches square and decided on a layout that requires no sashing between blocks. 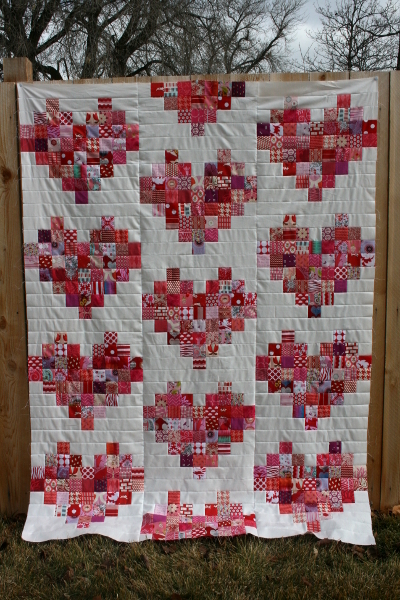 Honestly, I think that’s my favorite thing about this quilt – the offset center strip of hearts that gives movement to it and prevents the white background from being overwhelming. I cut strips of red, pink, purple and a bit of coral/orange fabrics for this quilt as I wanted each block to have lots to look at. The range in colors also enhances the pixelated look of the quilt. My littles are already enjoying picking out small details as they wait anxiously for me to finish this project! The quilt top measures 53″ wide by 72″ long, a great size for two little sisters to snuggle under together. A backing has been selected and I’m hoping for time to baste it later today. Piecing this quilt top was relaxing and fun and I’m so glad I did it. We’ll see if I can finish it by Friday! *edited to add: I was asked to share a tutorial for this quilt top. Find it here. So fun! It really is a gorgeous quilt, love the offset center blocks as well. Your quilt is beautiful! Will you share the pattern or a tutorial? I would love to make one for my daughter. 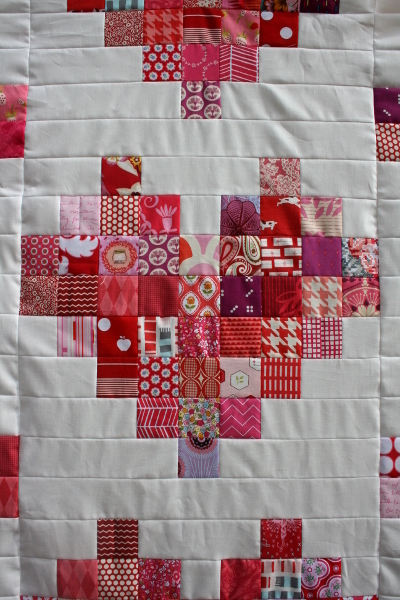 Beautiful quilt, sure your littlest will spend many happy hours snuggled up under it! I’d be happy to share! I’ll start working on it tonight. Watch for it in the next few days. Thanks for visiting! 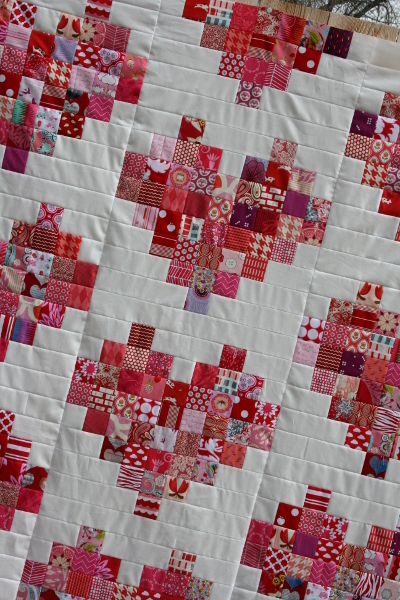 I really love your scrappy hearts, the quilt top looks great! I hope you get it finished by Friday. I also have a Valentine’s Day project to finish. I love it! The scrappiness and off set rows are fantastic. i love this quilt. I would love to have the pattern for it. I absolutely love it!!! is it possible to get the written pattern? Beautiful quilt! How much material did you use to make it?